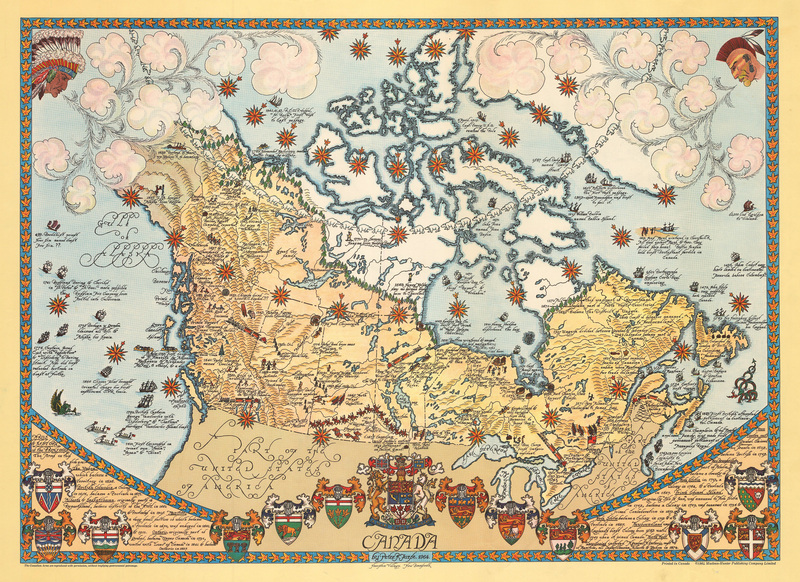 This marvelous pictorial map of Canada by Peter Reynolds Furse depicts much of the history of Canada dating from the fifth century through the mid twentieth in grand pictorial fashion, combining many elements of mapmaking from earliest times to the modern era. On the right side of the map, to the east and north of Canada, Furse has depicted early mariners and noted what were the earliest known voyages to the New World, including that of Leif Ericson, as well as some later voyages dating to the fifteenth century when the English and Portuguese were sending exploratory expeditions to the West. The left side depicts the Pacific with many seagoing vessels of various kinds, including one from China which carried a Buddhist priest who is thought to have reached North America in 499 AD. Historical events of consequence to Canada are depicted, including the dates of occurrence of each. Captions in the lower corners describe the history of the provinces. Coats of arms of the provinces and territories are depicted along the lower portion of the map, along with the coats of arms of Canada itself. Miniature maple leafs are used to form an attractive border around the map. Polar bears are used to depict the Arctic Circle, and evergreen trees are used to depict the tree line in Canada’s far northern reaches. Peter Reynolds Furse was born 29 Oct 1901 in Farnham, Hampshire, Surrey, England. He entered the Royal Navy during WWI at age 17. He was a cartographer and graduated Emmanuel College, University of Cambridge in 1922. He rose to the rank of Lt. Commander, Royal Navy. He eventually retired in Hampton, New Brunswick Canada where he became an artist. Condition: This splendid pictorial map is in B+ condition with a few vertical folds and a tear within a wide margin that would be covered when matted and framed. 1593 Americae Pars Borealis Florida, Baccalaos, Canada, Corterealis.